And, no, I don't follow the Sydney Swans. I follow nature, as best I can at least. I refer to some of my broad bean plants and possibly a few tomatoes after the howling winds of the day that not only gave my garden a bit of a battering, but me too as we hiked a rather ridiculous number of kilometres along the bay today. Why? I really don't know. It sounded like a good idea at the time. 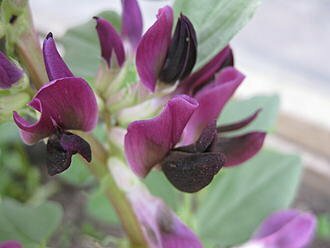 I arrived home to find that several broad bean branches (including my stunning crimson flowering ones) succumbed to the wind and my newly planted tomato seedlings look like they've been under a hair dryer for hours, which in effect they have given today's hot northerly. As for me, I look pretty much the same. With that in mind, I'm off to the garden to repair the damage and then heading for the couch to lick my wounds. I'm toast. Actually, not toast. I'll be the marinated, slow-cooked chicken maryland with sweet potato, carrots and organic pumpkin with a side of rice that I cooked yesterday - and I'll be licking my fingers. Some you win; some you lose. And who am I to argue. Please comment about anything except football - and horse racing.